Arizona has forever appealed to pioneers searching for new and exciting horizons. The Sonora desert area where SaddleBrooke Ranch is located provides views that stretch on forever. The open desert area creates a sense of freedom and opportunities to achieve new heights. 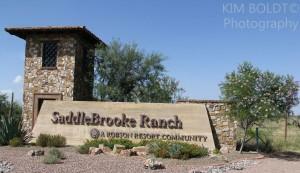 SaddleBrooke Ranch is the newest Robson Resort Community in Tucson AZ. It is located about 20 miles north of Tucson AZ. SaddleBrooke Ranch is about 7 miles north of Robson’s first Tucson development of SaddleBrooke. This new Robson Community is planned to have over 6,500 homes and a wide array of SaddleBrooke Ranch home floor plans. SaddleBrooke Ranch provides owners an opportunity to get in on the ground floor of this new Robson Resort Community. As you drive through the entry gate, the tranquility and quiet surroundings are evident. The amenities of SaddleBrooke Ranch include the beautiful La Hacienda Club. This facility is the focal point of the community. It features outdoor and indoor pools, fitness center, tennis complex and sports courts, a spa, barber shop, learning center & art room, bistro & lounge and more. Golf is available at a SaddleBrooke Ranch Golf Club. The course is relatively easy to play, but you need to hit is straight and avoid the washes that cross the fairways to score well. With so many SaddleBrooke Ranch home floor plans make it easy to create your own kind of lifestyle. Here you don’t have to settle for anything, except what you want to do today. There are 10 SaddleBrooke Ranch Home floor plans to select from. All give the buyer an opportunity to choose floor plan options to meet their unique needs. At this time, SaddleBrooke Ranch residents have full access to the facilities and facilities at nearby SaddleBrooke. If you are considering a new home in SaddleBrooke Ranch, SaddleBrooke, Quail Creek or any other location in the greater Tucson area, we can help.